The most widely used processes for the degradation of feathers use pure strains of bacteria. The aim of this research is to standardize the optimum laboratory conditions for the biodegradation of chicken feathers. The study was conducted in one-liter flasks with a co-culture of bacteria isolated and identified by 16S rDNA sequencing as Alcaligenes faecalis and Brevundimonas diminuta from a chicken processing plant. The best results obtained in the first stage (temperature and carbon source) informed the second stage, which consisted in the evaluation of the degradation of feathers using different concentrations of nutrient broth (25%, 50% and 100%). The concentration of protein and amino acids was quantified for evaluated the degradation of feathers. The results showed that the proposed method can achieve total degradation of feathers (including the rachis) at 11 days with nutrient broth. The maximum concentration of protein in the soluble fraction obtained after the degradation process at 32°C and with nutrient broth at 25%, 50% and 100%, was 12.60 μg/mL ± 0.1 μg/mL, 14.60 μg/mL ± 0.02 μg/mL and 18.60 μg/mL ± 0.01 μg/mL, respectively. The production of free amino acids was 2.64 mg/mL and detected tryptophan and tyrosine. This study shows a promising biotechnology for reducing pollution by feathers. In the world a large amount of chicken feathers are generated, these are considered as waste . These feathers proceed mainly from chicken processing plants and poultry farms; they represent a great source of pollution because between 5 and 10% of the total weight of the chicken are feathers . One of the first methods used to reduce the impact of the pollution generated by chicken feathers was to incorporate them into animal feed supplements, since 95% of their dry weight is protein, of which 88% is keratin . However, the disulfide bridges, hydrogen bonds and hydrophobic interactions of keratin make it insoluble and very difficult to digest . Several studies have tried to increase its solubility by subjecting it to a process with high pressure and temperature; however, this process has serious disadvantages, including its high cost and the destruction of some thermolabile amino acids such as histidine, methionine and tryptophan . Kornillowicz-Kowalska mention that these problems have led to a radical change in the methods used to dispose of feathers. The new methods studied in recent years involve the biodegradation of feathers through fermentation using microorganisms or enzymes; these processes are economical and also allow the development of new products . Recent studies have evaluated the degradation of feathers by microorganisms such as bacteria of the following genera: Bacillus [6-12], Chryseobacterium , Kocuria [3,4,14], Xanthomonas [15,16], Pseudomonas [2,17,18], Leuconostoc , Scopulariopsis , Stenotrophomonas , Fervidobacterium ; actinomycetes such as Actinomadura ; fungi such as Coprinopsis and Aspergillus [23,24], consortia of bacteria  and consortia de actinomycetes . Moreover, some authors have made genetic modifications to strains of Escherichia coli, Brevibacillus sp. and Bacillus subtilis in order to accelerate the degradation of chicken feathers [27-29]. Given the difficulty of maintaining pure and genetically modified strains under sterile conditions using complex substrates such as chicken feathers, an increasing number of studies have focused on the degradation of chicken feathers using microbial consortia and co-cultures, which can be produced in large-scale, in contrast with pure cultures, which are not often economically feasible due to the high costs of maintenance, substrates, sterilization, and recovery of biomass, among other factors . Because of the importance of microbial consortia and co-cultures in the degradation of chicken feathers, it is useful to identify the microorganisms that form part of these cultures using molecular tools . The techniques used for Yusuf et al. for the identification of isolated cultures of feathers include the analysis of the 16S rDNA sequence complemented by a morphological study of the strains. Among the most important microorganisms identified morphologically and phylogenetically in the process of degradation of chicken feathers, we can mention Bacillus licheniformis, Streptomyces sp. and Alcaligenes sp. [32,33]. In Mexico, there are few studies on the degradation of poultry waste using microbial consortium or co-culture. Our working group isolated strains of these microorganisms from the chicken processing plant Las Rosas, located in Tizayuca, Hidalgo, Mexico. These strains were later combined to form a co-culture in order to improve the process of biological of chicken feathers. The aim of this research was to standardize the optimum laboratory conditions for the biodegradation of chicken feathers. A proximate analysis of the feathers was performed to determine moisture using a digital moisture analyzer (MB45, OHAUS9), protein content using a Micro Kheldahl apparatus (AOAC 47021), ether extract using a Soxhlet apparatus (AOAC 920.39C), ashes using the Kleem method (AOAC 14.006) and fiber content using the Wendy method (AOAC 7.064) . Preparation of the feathers: The feathers were washed with tap water and allowed to dry for 24 h at 60°C. Five grams were weighed and washed 2 times in boiling water for 5 min before being placed in the flask. The study was conducted in one-liter flasks with a working volume of 500 mL. A mixture of 5.3 × 105 ± 0.1 × 105 CFU of strain 1 and 5.0 × 105 ± 0.25 × 105 CFU of strain 2 previously grown in nutrient broth were added to the flasks. The culture conditions were: stirring at 120 rpm and pH 6.8-7.2 for 14 days. In the first stage, an experimental design 32 was used to evaluate the following factors: temperature (25°C, 32°C and 37°C) and carbon source (whey, nutrient broth and Luria-Bertani broth). In the second stage, the degradation of the feathers was evaluated with different concentrations of nutrient broth (25%, 50% and 100%), with the same conditions that the first stage. The degradation of the feathers and the growth of bacteria were evaluated by measuring absorbance at 620 nm according to previous reports [4,35]. After the degradation process, the samples were filtered through Whatman glass fiber paper (GF/A paper, 22 mm diameter) to quantify the concentration of protein in the soluble fraction was determined according to the method of ; to build the calibration curve, we used bovine albumin (SPINREACT, S.A/S.A.U. ); the concentration of amino acids was determined by the ninhidrin method . Aromatic amino acids were detected by ultraviolet light spectrophotometry at 280 nm with standards of tyrosine (Sigma-Aldrich, Japan) and tryptophan (Merck, Germany). The extraction of genomic DNA was performed using the CTAB method as indicated by . The amplification of 16S rDNA was performed in a Perkin-Elmer 2400 thermocycler using the following universal primers: FD1 (5’-agagtttgatcctggctcag-3’) and RP1 (5’-acggttaccttgttacgactt-3’) . The PCR was performed with an initial denaturation of 95°C for 5 min, and each cycle with a denaturation of 95°C for 30 s, an alignment of 48°C for 30 s, an extension of 72°C for 90 s, and a final extension of 72°C for 8 min, with a total of 35 cycles . The PCR products were sequenced by Macrogen Korea; they were described as the partial sequence of 16S rDNA. A BLAST alignment was performed to determine genus and species. The samples of the structure (spherical and elliptical) formed during the degradation of the rachis of the feathers were fixed in glutaraldehyde (3.0%) in phosphate buffer (0.1 M; pH 7.2) for 24 h at room temperature. They were rinsed 2 times with deionized water and allowed to stand in deionized water for 40 min. Post-fixation was performed in osmium tetroxide (1%) for one hour and then the samples were rinsed with phosphate buffer. After post-fixation, the samples were dehydrated in a series of alcohols at different concentrations and dried to a critical point. They were then coated with a thin layer of gold-palladium for 60 seconds using a Jeol, JFC-1100 fine coat ion sputter. The samples were observed in a scanning electron microscope JEOL JSM 6390 at 5, 000 and 10, 000 x. The influence of the factors studied (temperature and carbon source) on the degradation of feathers was determined by ANOVA analysis was performed using Minitab statistical software with a significance level (α) of 0.05. The Table 1 shows the composition of chicken feathers. The feathers are constituted of proteins mainly (89%), fibers (8%), fat (2%), and in less proportion by inorganic substances (0.6%) . Reported that protein content is about 76% and the total content of keratin is 72%. On the other hand, in literature reported that the feathers are composed of proteins (90%-95%) and lipids (5%-10%) [10,41] similar results obtained in our research. Table 1: Composition of chicken feathers. Figure 1a, b and c show the results of the degradation of feathers; in all cases, the absorbance increases with the growth of bacteria, indicating the degradation of feathers, the better biomass growth was at 32°C using the three-carbon source (nutrient broth, whey and Luria-Bertani), the maximum absorbance obtained were 5.1, 12.23, 6.2 to 14, 7 and 14 days respectively. The absorbance is related to the degradation of chicken feathers. The total feathers degradation was observed at 11 and 14 days using nutrient broth and Luria-Bertani respectively. Chaturvedi et al. conducted a study on the degradation of feathers under similar conditions. They placed 5 grams of feathers in a 250 mL flask at 30°C, with pH 7.5 and 125 rpm. They observed an increased growth of cells during the degradation of feathers. Figure 1: Growth and degradation of feathers: a) nutrient broth, b) whey, c) Luria-Bertani broth. The ANOVA analysis showed that the factors under study had a significant on the degradation of chicken feathers. The average absorbance for temperature was 4.60, 7.06 and 4.08 at 25°C, 32°C and 37°C, respectively (Figure 2). The average absorbance for the carbon sources was 5.82, 4.91 and 4.87 for whey, nutrient broth and Luria-Bertani broth, respectively (Figure 3). The highest absorbance was observed at 32°C, using whey as carbon source. However, the high absorbance was only due to the growth of the bacteria when consuming the whey and not for the degradation of the feathers, visually the feathers were complete in this experiment. According with the results the second-high absorbance was with nutrient broth at the same temperature and the total degradation of feathers was observed. Therefore, the second stage of the study was carried out with nutrient broth at 32°C. In all experiments a control was used (distilled water+co-culture+feathers) showed a lineal growth (absorbance: 0.8 ± 0.2) through the time. For this is important use a carbon source additional. Figure 2: Effect of temperature on the degradation of chicken feathers (ANOVA analysis). 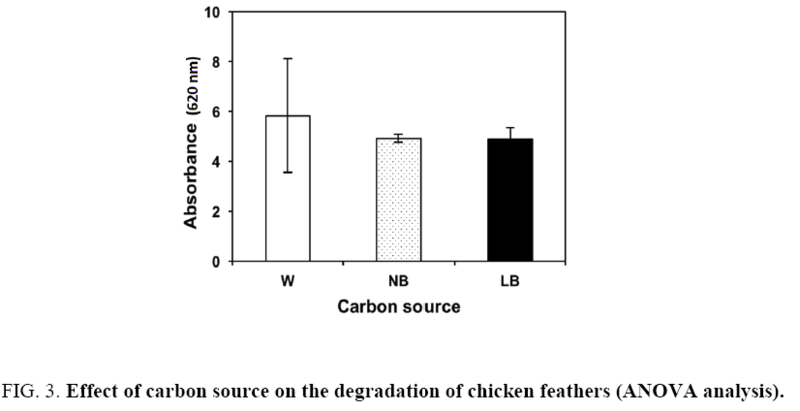 Figure 3: Effect of carbon source on the degradation of chicken feathers (ANOVA analysis). Some authors have observed that, in the absence of feathers, and with a carbon source, Bacillus megaterium produces almost no keratinolytic enzyme. The presence of feathers greatly increases the production of this enzyme compared to the medium without feathers. Furthermore, it has been observed that the combination of feathers and some carbon source (glucose, fructose, galactose, mannitol, soluble starch, etc.) causes a high production of the keratinolytic enzyme . In the second part of the study (At 32°C with nutrient broth), three different concentrations of the nutrient broth were used to determine its influence on the degradation of feathers. The results showed that the concentration of soluble protein (Figure 4) increased with increasing concentrations of nutrient broth (25%, 50% and 100%) 12.60 ± 0.1, 14.60 ± 0.02 and 18.60 ± 0.01 μg/mL, respectively. The highest concentration of soluble protein (18.6 μg/mL) was obtained by using nutrient broth at 100% in the fermentation process, which promoted the growth of the co-culture. These results are similar to those obtained by Jeong et al. , who used different carbon sources (glucose, mannitol, soluble starch, etc.) with Stenotrophomonas maltophilia to degrade feathers and obtained a concentration of soluble protein of 13.8 ± 0.7-19.7 ± 2.6 μg/mL, the minimal and maximal concentration was obtained with Lactose and soluble starch respectively. They observed that the maximum activity of the keratinolytic enzyme (29.5 ± 0.5 U/mL), and the maximum values of cell growth and concentration of soluble protein were obtained by adding glucose at 2%. Grazziotin et al. also report a higher degree of keratin hydrolysis and an increased proportion of smaller and more soluble keratin peptides could be recovered as soluble protein. Figure 4: Concentration of soluble protein in the degradation of chicken feathers with nutrient broth. In this study, the production of free amino acids was 2.64 mg/mL and detected tryptophan and tyrosine by ultraviolet spectrophotometry after 14 days of the degradation process. Kani et al. reported concentration of soluble protein and amino acid during degradation of feather by Pseudomonas microphilus and Leuconostoc sp. after of 10, 20 and 30 days of degradation, the maximum protein concentration was 0.548 and 0.118 mg/mL with Pseudomonas microphilus and Leuconostoc sp. respectively in 30 days, and the maximum amino acid concentration was 1.992 and 1.682 mg/mL with Pseudomonas microphilus and Leuconostoc sp. respectively at the same time. Nam et al. who conducted a study on the degradation of feathers in thermophilic conditions with Fervidobacterium islandicum AW-1, found that the amino acids produced after degradation were histidine, cysteine and lysine (belonging to the feathers). They also found essential amino acids such as methionine and tryptophan, which are present in low concentration in feather keratin. In other studies, it has been found that after five days of degradation of chicken feathers with Stenotrophomona maltophilia, the concentration of amino acids is 2298.8 μM and detected the presence of amino acids like tryptophan and tyrosine in addition to isoleucine, leucine, lysine, methionine, phenylalanine, threonine and valin . Morphological studies showed that the three strains isolated are Gram negative bacteria in the form of cocci and bacilli. The sequence analysis of 16S rDNA showed a high sequence identity to two subspecies of Alcaligenes faecalis (96% and 97% homology) for the strain 1 and to Brebundimonas diminuta (94%) for the strain 2. The sequences were compared whit accession numbers KX118704, KU494828 and KF453789 of GenBank. The first report that the species Alcaligenes faecalis can degrade feathers was published by Yusuf et al. . However, so far there is no report that the species Brebundimonas diminuta has this capacity. Bacteria of the genera Brevundimonas and Alcaligenes are Gram negative, oligotrophs and they are classified as alphaproteobacteria and betaprotobacteria respectively . The genus Alcaligenes is a bacterium in form to bar or Bacillus ; have been found in soil, water and wastewater; also, its ability to resist mercury has been observed because it is able to reduce Hg2 + to Hg0. In environmental this bacterium is important because have the capability to produce growth regulators auxins, cytokinins, gibberellins, or ethylene or abscisic acid, which stimulates plant growth, and it have been reported to degrade pesticides and hydrocarbons, both alkanes and polyaromatic compounds (PAHs) . Dille et al. isolate Brevundimonas from bird feathers of Junco hyemalis in R2A (þ cycloheximide) medium, this bacterium grew in keratin and exhibited lipase activity, suggesting that these enzymes isolates may degrade the feathers. By themselves, none of the three species of bacteria identified in this study were able to completely degrade the feathers (data not shown); however when the three bacteria acted together in a co-culture, they were able to degrade the feathers, including the rachis, in 11 days. These data show a similar behavior to that reported by Vasileiva-Tonkova et al. and Ichida et al. , who mentioned that mixed cultures of actinomycetes with Bacillus sp. and Streptomyces sp. degraded feathers more rapidly and completely compared to cultures of pure strains. It is worth noting that, after 48 h of growth, the concentration of soluble protein obtained with the mixed was twice higher than that obtained with the culture of pure strains. The electron microscopy study showed that, in a first stage, the bacteria degraded the barbules of the feathers (during 9 days); in a second stage, the bacteria formed round and elliptical structures (Figure 5) around the rachis in order to degrade it. The study of these structures revealed the presence of bacteria in the form of bacilli on the fibrils of the rachis during the degradation process, and a large amount of bacteria in the sediment formed after degradation (Figure 6). Figure 5: Round and elliptical structures in rachis during the degradation of the feathers. a) elliptical structures attached to rachis b) elliptic structure at the end of degradation. Figure 6: Micrography of degradation of feathers: a) Bacteria on a fibril during the degradation of the rachis inside the elliptical structure. b) Bacteria in the sediment at the end of degradation. Some studies have used scanning electron microscopy to verify the degradation of the feathers with different microorganism [15,18], for example Al-Musallam et al. who realized the feathers degradation using fungal, showed dense biofilms of fungal mycelia binding the feather fractions, obtained decomposed feathers within three weeks. Also, Jeong et al. studied the degradation of chicken feathers using Stenotrophomonas maltophilia R13, and verified the degradation by scanning electron microscopy. They reported that the barbules were degraded to 2 days of incubation and the feather axis to 4 days of incubation; they also reported an aggregate of bacteria embedded in an extracellular matrix adhering to the degradation surface. Two subspecies of Alcaligenes faecalis and Brebundimonas diminuta were identified by sequencing in this study. The co-culture of bacteria used in this study showed a high potential for use in the total degradation of feathers (including the rachis). The formation of round or elliptical structures around the rachis allows the bacteria to degrade it completely. The ANOVA analysis showed that the temperature and the carbon source had a significantly influence on the degradation of chicken feathers. Proteins and amino acids obtained as byproducts from the chicken feathers biodegradation of native strains may be of biotechnological interest. We thank the technical support of Valencia Ramirez Valentín (TSU), of Victoria Enciso Tenorio (IBT). We thank Dra. Hilda Zavaleta Mancera, from the Colegio de Postgraduados for providing technical and financial support in the use of scanning electron microscopy. Tuna A, Okumu? Y, Çelebi H, et al. Thermochemical conversion of poultry chicken feather fibers of different colors into microporous fibers. Journal of Analytical and Applied Pyrolysis. 2015;115:112-24. Kani TP, Subha K, Madhanraj P, et al. A. P. Degradation of chicken feathers by Leuconostoc sp. and Pseudomonas microphilus. Euro J of Exp Biol. 2012;2:358-62. Costa JC, Barbosa SG, Sousa DZ. Effects of pre-treatment and bioaugmentation strategies on the anaerobic digestion of chicken feathers. Bioresour Technol. 2012;120:114-9. Coello N, Vidal L, Bretaña A. Aislamiento de unacepa de Kocuriaroseadegradadora de plumas de aves de corral. RevistaCientifica FCV-Luz. 2000;10:107-13. Korni? ?owicz-Kowalska T, Bohacz J. Dynamics of growth and succession of bacterial and fungal communities during composting of feather waste. Bioresour Technol. 2010;101:1268-76. Liu Q, Zhang T, Song N, et al. Purification and characterization of four key enzymes from a feather-degrading Bacillus subtilis from the gut of tarantula Chilobrachysguangxiensis. IntBiodeterior&Biodegradation . 2014;96:26-32. Fakhfakh N, Ktari N, Haddar A, et al. Total solubilisation of the chicken feathers by fermentation with a keratinolytic bacterium, Bacillus pumilus A1, and the production of protein hydrolysate with high antioxidative activity. Process Biochem. 2011;46:1731-7. Kumar EV, Srijana M, Chaitanya K, et al. Biodegradation of poultry feathers by a novel bacterial isolate Bacillus altitudinis GVC11. Indian J of Biotechnol. 2011;10:502-7. Park GT, Son HJ. Keratinolytic activity of Bacillus megaterium F7-1, a feather-degrading mesophilic bacterium. MicrobiolResear. 2009;164:478-85. Forgács G, Alinezhad S, Mirabdollah A, et al. Biological treatment of chicken feather waste for improved biogas production. J of Environ Sci. 2011;23:1747-53. Tiwary E, Gupta R. Medium optimization for a novel 58 kDadimerickeratinase from Bacillus licheniformis ER-15: Biochemical characterization and application in feather degradation and dehairing of hides. Bioresour Technol. 2010;101:6103-10. Lo WH, Too JR, Wu JY. Production of keratinolytic enzyme by an indigenous feather-degrading strain Bacillus cereus Wu2. J BiosciBioeng. 2012;114:640-7. Fontoura R, Daroit DJ, Correa APF, et al. Production of feather hydrolysates with antioxidant, angiotensin-I converting enzyme and dipeptidyl peptidase-IV-inhibitory activities. New Biotechnol. 2014;31:506-13. Bertsch A, Álvarez R, Nereida C. Evaluación de la calidadnutricional de la harina de plumasfermentadasporkocuriaroseacomofuentealternativa de proteínas en la alimentación de aves. Revistacientífica FCV-LUZ. 2003;13:139-45. Jeong JH, Park KH, Oh DJ, et al. Keratinolytic enzyme-mediated biodegradation of recalcitrant feather by a newly isolated Xanthomonas sp. P5. Polymer Degradation and Stability. 2010;95:1969-77. Toni CH, Richter MF, Chagas JR, et al. Purification and characterization of an alkaline serine endopeptidase from a feather-degrading Xanthomonasmaltophilia strain. C J Microbiol. 2002;48:342-8. Chaturvedi V, Bhange K, Bhatt R, et al. Biodetoxification of high amounts of malachite green by a multifunctional strain of Pseudomonas mendocina and its ability to metabolize dye adsorbed chicken feathers. J Environ Chem Eng. 2013;1:1205-13. Chaturvedi V, Bhange K, Bhatt R, et al. Production of kertinases using chicken feathers as substrate by a novel multifunctional strain of Pseudomonas stutzeri and its dehairing application. Biocatalysis and Agricultural Biotechnology. 2014;3:167-74. Sharaf EF, Khalil NM. Keratinolytic activity of purified alkaline keratinase produced by Scopulariopsisbrevicaulis (Sacc.) and its amino acids profile. S J Biol Sci. 2011;18:117-21. Jeong JH, Lee OM, Jeon YD, et al. Production of keratinolytic enzyme by a newly isolated feather-degrading Stenotrophomonasmaltophilia that produces plant growth-promoting activity. Process Biochem. 2010;45:1738-45. Nam GW, Lee DW, Lee HS, et al. Native-feather degradation by Fervidobacteriumislandicum AW-1, a newly isolated keratinase-producing thermophilic anaerobe. Arch Microbiol. 2002;178:538-47. Habbeche A, Saoudi B, Jaouadi B, et al. Purification and biochemical characterization of a detergent-stable keratinase from a newly thermophilicactinomyceteActinomadurakeratinilytica strain Cpt29 isolated from poultry compost. J BiosciBioeng. 2014;117:413-21. Musallam AA, Gharabally DH, Vadakkancheril N. Biodegradation of keratin in mineral-based feather medium by thermophilic strains of a new Coprinopsis sp. IntBiodeterior& Biodegradation. 2013;79:42-8. Mazotto AM, Couri S, Damaso MCT, et al. Degradation of feather waste by Aspergillusnigerkeratinases: Comparison of submerged and solid-state fermentation. IntBiodeterior& Biodegradation. 2013;85:189-95. Xia Y, Massé DI, McAllister TA, et al. Anaerobic digestion of chicken feather with swine manure or slaughterhouse sludge for biogas production. Waste Management. 2012;32:404-9. VasilevaTonkova E, Gousterova A, Neshev G. Ecologically safe method for improved feather wastes biodegradation. IntBiodeterior& Biodegradation. 2009;63:1008-12. Mukherjee AK, Rai SK, Bordoloi NK. Biodegradation of waste chicken-feathers by an alkaline β-keratinase (Mukartinase) purified from a mutant Brevibacillus sp. strain AS-S10-II. IntBiodeterior& Biodegradation. 2011;65:1229-37. Zaghloul TI, Embaby AM, Elmahdy AR. Biodegradation of chicken feathers waste directed by Bacillus subtilis recombinant cells: Scaling up in a laboratory scale fermentor. Bioresour Technol. 2011;102:2387-93. Sharma R, Verma VV, Gupta R. Functional characterization of an extracellular keratinolytic protease, Ker AP from Pseudomonas aeruginosa KS-1: A putative aminopeptidase with PA domain. J Mol Catalysis B: Enzymatic. 2013;91:8-16. Höffber K, Barton PI. Design of Microbial Consortia for Industrial Biotechnology. Proceedings of the 8th International Conference on Foundations of Computer-Aided Process Design – FOCAPD 2014:1-10. Cao L, Tan H, Liu Y, et al. Characterization of a new keratinolyticTrichodermaatroviride strain F6 that completely degrades native chicken feather. LettApplMicrobiol. 2008;46:389-94. Yusuf I, Ahmad SA, Phang LY, et al. Keratinase production and biodegradation of polluted secondary chicken feather wastes by a newly isolated multi heavy metal tolerant bacterium-Alcaligenes sp. AQ05-001. J Environ Manage. 2016;183 (1):182-95. Ichida JM, Krizova L, LeFevre CA, et al. Bacterial inoculum enhances keratin degradation and biofilm formation in poultry compost. J Microbiol Methods. 2001;47:199-208. AOAC. Official methods of analysis. AOAC international, Gaithersburg, USA 2012;18th ed. Agrahari S, Wadhwa N. Degradation of chicken feather a poultry waste product by keratinolytic bacteria isolated from dumping site at ghazipur poultry processing plant. Int J Poultry Sci. 2010;9:482-9. Moore S, Stein WH. A modified ninhydrin reagent for the photometric determination of amino acids and related compounds. J Biol Chem. 1954;211:907-13. Minas K, McEwan NR. Optimization of a high-throughput CTAB-based protocol for the extraction of qPCR-grade DNA from rumen fluid, plant and bacterial pure cultures. FEMS Microbiology Letters. 2011;325:162-9. Chen J, Ding S, Ji Y, et al. Microwave-enhanced hydrolysis of poultry feather to produce amino acid. Chemical Engineering and Processing: Process Intensification. 2015;87:104-9. OuledHaddar H, Zaghloul TI, Saeed HM,et al. Production of feather protein hydrolysate by keratinolytic bacterium Vibrio sp. kr2 Biodegradation. Bioresour Technol. 2009;20:687. Grazziotin A, Pimentel FA, Sangali S, et al. Production of feather protein hydrolysate by keratinolytic bacterium Vibrio sp. kr2. Bioresour Technol. 2007;98:3172-5. Vancanneyt M, Segers P, Abraham WR, et al. Brevundimonas. Bergey's Manual of Systematics of Archaea and Bacteria: John Wiley & Sons, Ltd; 2015. Paul EA. Soil microbiology, ecology, and biochemistry in perspective. Soil Microbiology, Ecology and Biochemistry. 3rd ed. San Diego: Academic Press; 2007. P:3-24. Dille JW, Rogers CM, Schneegurt MA. Isolation and characterization of bacteria from the feathers of wild Dark-eyed Juncos (Junco hyemalis). The Auk. 2016;133:155-67.